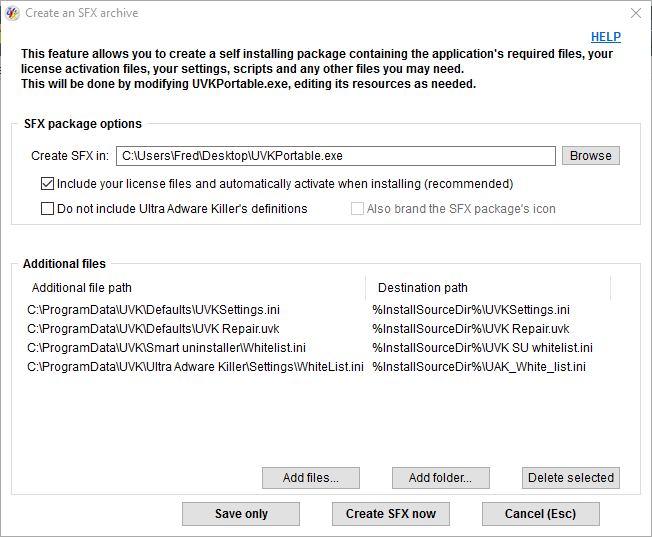 The SFX package creator, introduced in version 10.3.4, allows UVK registered users to easily create a self installing package containing all the application files in it and also any other files you may want to add. The generated archive can be used in remote support, or copied to a USB drive or network loacation for a fast apllication setup and activation. The main benefit from using a custom SFX package is that you can load all your UVK customizations and other settings with just a few clicks, in every computer you work on. Also, all the files and scripts you usually use in your repairs can be made instantly available for use. When the SFX package installs, the extra files you added to the package are extracted to the Third party sub-directory of UVK's installation folder. This ensures those files are removed on uninstall. In SFX derived installations, the Third party folder can be accessed from within UVK by using either the %ThirdParty% or the %InstallSourceDir% environment variables. UVK already provided a similar fucntionality through the ZIP package, to which you can manually add files, but we thought this is a more professional and easier way of carrying all the desired files and settings in one archive and automatically installing them in the target machine. It is important to know that, in SFX archive derived installations, as well as the ZIP package ones, the %InstallSourceDir% environment variable can not be changed; it will always point to the Third party sub-directory. In order to access the SFX creator, press Options, in the Home section, then select the Utilities tab, and finally press Create SFX package. You will be presented with a dialog box similar to the one in the picture below. All the options in this dialog box are pretty much self-explanatory, and they have mouse-over tolltips, so you should not have any dificulty to setup your SFX package. We will explain them more accurately here, though. By default, your SFX archive will be created in the current user's desktop folder and will be named UVKPortable.exe. If you want to change the name or location of the file, press the Browse button, or manually enter the new path/name in the text input box. This text box also supports drag & drop of files. If you do not want your license information to be included in the SFX package, uncheck this option. If you want to reduce the size of your SFX package, select this option. In that case, UAK's definitions database will not be included in the package. That does not mean Ultra Adware Killer will no longer work; the database will be downloaded at runtime, but it requires an active Internet connection in the target machine. This option, obviously available only for 'Branding' users, will brand the SFX package's icon with a thumbnail of your logo picture. You can add files and folders to your SFX package by pressing the Add files... and Add folder... buttons, respectively.To remove previously added files and folders, select the desired ones in the list and press Delete selected. You can select several items to be removed at once. This action only removes the selected items from the list, it does not delete the listed file objects from the disk. Once you configure the desired options, press Create SFX now to start creating the SFX package. UVK will need an active Internet connection to download UVKPortable.exe from our server. Once the file is downloaded, UVK will edit its resources, adding the required files. Thus, the SFX creation will fail if UVKPortable.exe can not be downloaded for any reason. You will get a tooltip message saying whether the archive was successfully created or not, and if not, the reason why. To finish using the SFX creation utility, press Cancel (Esc), or simply close this dialog box.